See coverage for 13 different regions of the Area Research Center Network. Each Area Research Center serves a specific geographic region. Records created in and focused on the region served by a particular ARC are housed permanently at the appropriate Center. You can access most collections from across the state and have them sent to your region from anywhere in the network. The Society maintains a courier service which allows members of the network to borrow collections housed elsewhere for use by their local patrons. The Wisconsin Historical Society and the University of Wisconsin System cooperate in a network of Area Research Centers located at the campus libraries throughout the state and at the Northern Great Lakes Visitor Center. Records particular to the local area are housed permanently at each Center and circulate within the network. For network purposes, the state is divided into fourteen regions. Thirteen of the regions are served by an Area Research Center, and one is served by the Wisconsin Historical Society in Madison. Each region consists of one or more counties (see image above). Records created by county offices and other local government units for the region are housed at the Area Research Center, as are non-governmental manuscript collections of regional interest. Historical records gathered through the network generally are organized and cataloged by archivists at the Society Headquarters in Madison. The materials then are returned to the appropriate Area Research Center. Most centers also hold archival records from their campuses and additional special collection holdings not owned by the Society. Historical records owned by the Society can be accessed via the Library Catalog regardless of their location. Archivists at each Area Research Center answer written and telephone reference requests and help the public use the network's resources. 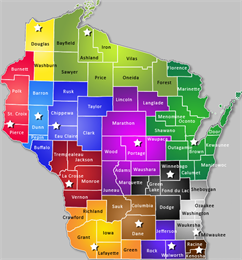 Archival collections usually located at the Wisconsin Historical Society or at one of the Area Research Centers may be transferred temporarily within the network to accommodate local historians, genealogists, students and other scholars throughout Wisconsin. Before their initial visit, researchers are advised to write or call the appropriate repository since some collections may be on loan and hours may vary.